St. Louis Star-Times article from 1941. Click to view larger version. Part of what makes the Campbell House Museum so special is its collection of thousands of original furnishings and personal items left behind by the Campbell family. CHM’s originally-furnished interiors are nearly unparalleled in the United States – it’s a special place. But it’s important to note that we don’t have everything. In fact, we’re missing quite a bit. Large pieces of furniture, beautiful works of art and countless papers, books and knick-knacks have left the halls of the Campbell House over the years. The big reason? An auction of the house’s contents that happened in 1941. Click the gallery below to view the slideshow. 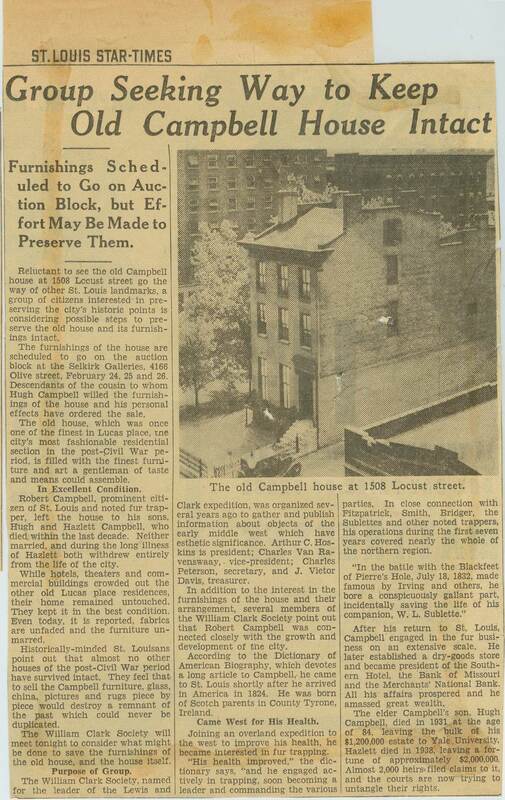 While the Campbell House has an incredible number of original family items in its collection, many pieces were lost at an auction of the house’s contents in 1941. Handled by local auction house Selkirk’s, pieces ranging from jeweled tankards to silver and fine china left the Campbell House, some for the first time in over a century. These battle axes likely belonged to James Campbell and are pictured here in his rooms at the Campbell House ca. 1885. Several pieces of statuary in historic pictures of the house are missing today. This massive bronze piece, entitled “Gloria Victis”stands in the middle of the front Parlor at the Campbell House ca. 1930. It was likely originally purchased for an apartment owned by the Campbell sons in Paris, France. Today, the Campbells’ Gloria Victis stands in a family mausoleum at a local St. Louis. The piece was sold at the auction of Campbell House’s contents in 1941. Another large statue was found in the Dining Room. This bronze, entitled “The Florentine Singer” likely stood watch for decades in the same spot. All that remains today is a ghost mark of the statue’s base on the Dining Room’s oak floor. This piece too stands today in a family mausoleum in a local cemetery after being sold at auction in 1941. Though Campbell House’s collection contains thousands of original family furnishings and personal items, very little belonging to the servants and enslaved people who also lived at the Campbell House remains. When the Museum opened in 1943, servant furniture was not saved and spaces used by “the help” were either closed off, converted to display galleries and even used as a break room for docents. Pictured here is an image of the Head Housekeeper’s bedroom, ca. 1910. This photograph was recently donated to the Museum by the family of longtime Campbell servant Mary Boerste. Though Boerste’s furniture is long lost, the arrangement of the room’s period furniture has been changed to reflect the placement of the room’s original contents. Mary Boerste, pictured here in front of the garden gazebo at the Campbell House, worked for the Campbell sons as a housekeeper for more than thirty years. All that remains of her at CHM today are these treasured photographs. Perhaps the largest missing piece of the Campbell House collection is the Servant Hall which once stood at the rear of the property. This two story, four room building was home to the many servants who lived with and worked for the Campbell family over their 84 year tenure on Lucas Place. After the Campbell House opened as a Museum in 1943, the Servant Hall was converted into a caretakers residence. The Servant Hall was razed in 1968 to make way for a new staircase and office space off the back of the Museum. A planned tea room and lecture hall that would have filled most of the Servant Hall’s footprint was never realized. At any one time, 8 to 10 servants lived and worked with the Campbell family in the mid to late 19th century. By the early 20th century this number had shrunk to 3 or 4. Though Campbell House does still have a few of the Campbell family’s books, the vast majority were lost after Hazlett Campbell’s death in 1938. Many of the books seen on display today are antique replacements. Luckily, some of these books are still within reach here in St. Louis. The Campbell Family Bible is today part of the collection at the Missouri Historical Society. This magnificent set of Old Paris china was Virginia Campbell’s best, purchased in the 1850s for her new home on Lucas Place. Each piece in the set of more than 200 plates and dishes is painted with a different fruit, nut, vegetable or flower. Only about half of the set remains at CHM today. Even fewer pieces remain of Virginia Campbell’s finest set of Waterford crystal. The set was split in half and sold at the 1941 auction. A highlight of tours at CHM is the historic icebox in the kitchen. But did you know it isn’t the original? Like many other items from “The Help’s” sections of the house, the original icebox has been lost to time. The icebox in the kitchen today was purchased by the Museum in the early 2000s and is likely very similar to the original. When we zoom into this 1880s image of Hugh Campbell’s bedroom, we see an early camera on his center table. This boxy contraption points to the long-held theory that Hugh was an amateur photographer and may have even played a role in taking the invaluable pictures of nearly every room in the house that were the inspiration for our massive restoration in 2000. While most of the Campbells’ bedroom furniture was saved, two beds are conspicuously absent from the collection of the Campbell House Museum. These Victorian beds with rounded headboards may have been sold at the 1941 auction of the house’s contents. Another missing bed, this one from Hugh Campbell’s bedroom. Today this room has been restored as a library. One of the most striking missing pieces of the Campbell House collection is this bejeweled Russian tankard, pictured here in the Cambridge home of James Campbell during his years at Harvard. After his death in 1890, the tankard remained with his brothers at the Campbell House. It was sold at the auction of the house’s contents in 1941. In the past decade this tankard reappeared on the market. The 1941 buyer passed away and it again went up for auction. It was described as “Russian Jewel Encrusted Silver Tankard with elaborately worked foot & body with applied 8-pointed stars, surrounded by alternating rubies & emeralds” It sold for $34,000. In the second floor stairwell a furry friend peers into the Master Suite. This polar bear skin rug was sold at auction in 1941. In addition to beautiful furniture, the Campbell family had an impressive art collection. This painting, entitled “The Lost Greenhorn”, was one of a series by renowned American artist Alfred Jacob Miller. It was sold to an art dealer at auction in 1941 and today likely resides in a museum or private collection somewhere in the United States. This watercolor landscape, by the renowned St. Louis painter George Caleb Bingham, hung in the front hall of the Campbell House for nearly a century. The Campbells likely bought it in person from Bingham’s studio in St. Louis. Today the Campbell House Bingham landscape hangs in the Newark Museum in New Jersey after having been sold to a dealer at auction in 1941. A copy of the original in a similar frame hangs today in the front hall of the Campbell House Museum. Thanks, Richard! We appreciate your support!